Sovereign bond yields in the eurozone have declined significantly over the past year, both in absolute terms and relative to German bunds (pictured above). At the time, fears of a eurozone breakup topped the list of biggest tail risks facing investors, and the ECB was viewed as the only institution that could step in and calm the turmoil in sovereign bond markets. With Draghi’s reassurances a year ago, followed up by the introduction of the “Outright Monetary Transactions” (OMT) framework a month later, finally convinced investors that the ECB was willing to take action. Since Draghi’s speech, government borrowing costs in troubled eurozone periphery countries like Spain and Italy have fallen precipitously as investors have bought up government debt of those countries, forcing down bond yields. One year on from Mario Draghi’s “whatever it takes” speech, the correlation between the spreads of Bunds and BTPs relative to German debt is around 90%. Which makes sense if you see the OMT as the monetary equivalent of a nuclear deterrent – a powerful source of support to Europe’s markets, but one whose actual use would open a huge can of worms. Spain and Italy are both ‘OK’ as long as the status quo is maintained, with funding for banks through the ECB, funding of government debt through the banks, reassurance for all that Mr Draghi will hold everything together. 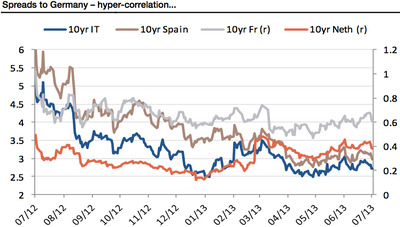 I still prefer Spain to Italy, still look for spreads to grind tighter. 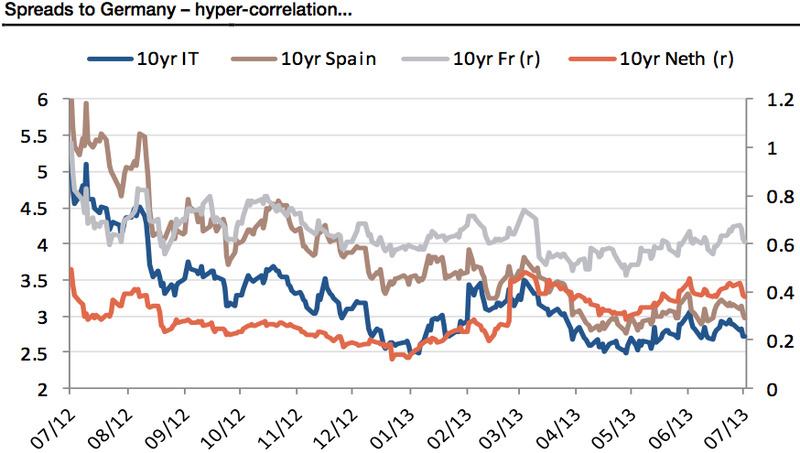 Within the ‘soft core’, correlations are not as tight, but with more yield and certainly no worse fundamentals, I definitely prefer French bonds to Dutch ones. Perhaps the most interesting thing about OMT is that the ECB hasn’t actually had to implement it yet. Just the threat of its existence has been enough to reassure investors in eurozone sovereign debt.